An audio version of this Captain’s Log is available. I remember it well, that day I saw the Starship Voyager set course for the Badlands to make history as the title ship of the unprecedented third Star Trek spin-off. It was a chilly January day back in 1995, and a group of friends and I had just returned from a trip to see Generations on the big screen. That trip was up to Birmingham, our college town of Tuscaloosa lacking a decent theatre. Also lacking in Tuscaloosa was a UPN affiliate—and not even the cable providers carried Birmingham’s UPN 68. During our trip we met up with my father, who handed off a video tape containing “Caretaker”—Voyager’s premiere episode. With delight we rushed back down the highway to our campus home. When we returned and gathered around the TV, a much anticipated moment came to pass. We were finally embarking on a journey to a brave new world. Just as Deep Space Nine had begun with a tie-in to the strong Next Generation, so Voyager started off with familiar elements of the solidly footed DS9. Soon after the episode was underway, however, the ship and her crew were flung away from the space station and all of the Star Trek universe. The reasoning behind the Lost In Space-theme seemed to be that the Alpha Quadrant had become so familiar, so predictable, that nothing short of a trip to the other side of the galaxy could take Star Trek to new ground. A novel idea had been crafted that would return the franchise to the exciting exploration of strange new worlds. The isolation of the Voyager crew would free them from the restraints of Klingons, Romulans, Ferengi, and the like. More transparently, Voyager was an attempt to return to the formula of The Original Series in which Kirk, Spock, and McCoy wandered around a galaxy that was largely unknown. This desire to break with the increasingly crowded and familiar world of TNG and DS9 came from an important revelation: with more than 300 hours of Star Trek already produced, it was becoming harder to find fresh ideas. Whether or not the problem was a lack of fresh ideas in general or a lack of fresh ideas among the writing staff is debatable. Deep Space Nine continued to turn out great material following the launch of Voyager by marching to its own drum rather than trying to mimic TOS and TNG. In fact, the best years of DS9 came after the launch of Voyager. Using the former Cardassian station as a launching pad, Voyager intended to create its own special niche in the Star Trek universe as well. It may have seemed like a brilliant idea when Berman, Piller, and Taylor sat down at the drawing board, but in the end it may not have been such a great move after all. Apparently the ship left the docking ring of DS9 without a game plan. Proving that some things are the same anywhere you go, we began our life in the Delta Quadrant with a familiar foe: the Klingons. Oh, sorry, I always forget: those weren’t Klingons, they were Kazon. I always get the ‘L-I-N-G’ and the ‘A-Z’ in the middle confused. The entire look and behavior of the Kazon proved that the writers lacked originality from the outset. Instead of a formidable foe that was as exotic as this unexplored part of the galaxy, they gave us Junkyard Klingons. Fortunately, the Kazon were shed fairly quickly in the overall scheme of things; although they did linger for longer than they should have. There came a time when it was no longer plausible that the same group of Kazon would still be in the area of Voyager. It had been established that they were technologically inferior to Starfleet, yet their ships still kept up with Janeway and her crew as they made their way across the galaxy. Apart from the Kazon/Klingon cloning (say that three times quickly), some other interesting “original” things happened during Voyager’s run. When times got tough and viewership was waning, familiar faces began appearing on our screens: Romulans, Ferengi, Hikaru Sulu, Q, and later the Borg and actual Klingons. It was as if the writers had come to terms with the fact that, without the established Star Trek framework, Voyager was on an aimless journey to nowhere. If you take some of these individual episodes: “Eye of the Needle” with the Romulans, “Flashback” with Sulu, “Deathwish” with Q, you find good stories. In fact, you find some of Voyager’s best stories; and therein lies a truth that the producers picked up on too late: colorful uniforms and technobabble are not enough to maintain the Star Trek formula. At its core Star Trek is about characters and ideas, not technology and prosthetics. And why is it that we are drawn to stories containing the familiar—be it familiar Alpha Quadrant races or familiar locales like Los Angeles (“Future’s End”)? I don’t think it is because as Star Trek fans we aren’t interested in meeting strange new aliens, but rather because meeting these new aliens for one episode and then dropping them leaves us with a feeling of disjointedness. 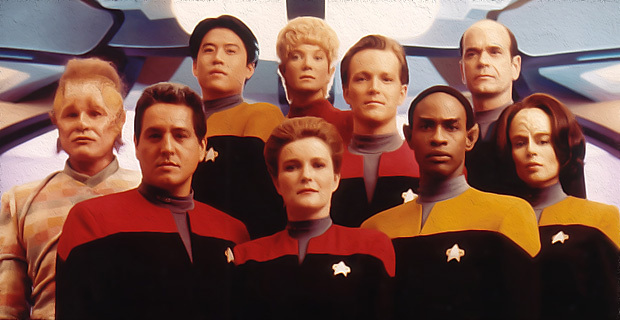 Perhaps Voyager should have taken its series name from one of its episodes: “Non Sequitur.” Viewers like to watch the development of ideas and themes. DS9 handled this masterfully with the Dominion War and even with the journeys of individual characters like Sisko and Kira. Watching Voyager was often like going to the library and reading only the first chapter of a dozen different books. It seemed that at times the writers realized that fans were unhappy with the absence of familiar Star Trek elements; and in the last two seasons they finally latched on to something that everyone could identify with as an integral part of the franchise. What they latched on to was the Borg. And at times it seemed as if the series should have been redubbed as such. It is natural that the introduction of Seven of Nine would bring with it more Borg involvement. And it is also natural that they would encounter the Borg all throughout their journey thanks to the transwarp conduit network and the fact that it was established in the TNG film First Contact that the Borg originated in the Delta Quadrant. But why turn to the Borg every time a big show is needed? Ratings Sweeps? Borg. Season cliffhanger? Borg. Series Finale? Borg. Of all the Borg episodes—there are 22 of them—there are only a couple that rank at the top of Voyager’s “Best Of” list. “Scorpion” is one, “Endgame” is decent, and, well, others don’t immediately come to mind. “Dark Frontier” was just an “Enterprise Incident” redux, double-length. 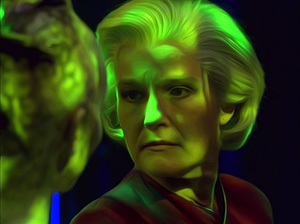 If you think of Voyager’s best stories, what comes to mind is not the neon green, black, and gray of a Borg set. It’s the temporal-isolation of a Krenim ship in “Year of Hell.” It’s the monochromatic romp in SF nostalgia in “Bride of Chaotica”. It’s the sappy Leave It To Beaver household of the Doctor’s pretend family in “Real Life”. Just good stories that don’t rely on an “old-faithful” backup to pull in the casual viewer. That’s why it came as somewhat of a disappointment when the final piece was put into position and Brannon Braga uttered that single, final word. You have to admit that the title is great. I knew the title long before I saw the episode since, back then, it took a while for me to get the tapes here in Japan. I’m a big fan of titles. TNG and DS9 both ended with brilliant ones: “All Good Things…” and “What You Leave Behind” respectively. Based on title alone I had high expectations going in. But high expectations are dangerous. Couple them with the way UPN hyped the episode for three months before it aired, and you knew you were in for a letdown. This is something I’ve learned as a college football fan. It’s hard to live up to that much hype. I’ll tell you up front that I thought “Endgame” was fun. It was nice seeing where all the characters would be in the future, and there was still this uncertainty as to whether or not they were going to get home. But the heavy reliance on the Borg was predictable, and the overall theme felt too much a recrafting of “All Good Things…” Like the finale of TNG, you have the crew when they are much older, you have a time travel story, you have everything revolving around the captain, and you have a future that turns out to never have happened. Plus, it left all kinds of unanswered questions about the state of the Borg—questions that were never answered on-screen “in canon” and were only resolved recently in the novels. The best part of “Endgame” was when Voyager emerged from the exploding Borg ship to face the armada of Starfleet vessels. The silence of the moment was powerful. You could really feel the crew’s emotions when they realized they had finally made it home; and required not a single word. You could sense how tired they were. In that single moment we felt a connection to the characters that we should have felt all along—in the very final moment of a journey that spanned more than 7,700 minutes. As closure, “Endgame” did a good job of summing up the whole series, just as “All Good Things…” did for TNG. Unfortunately, what it tells us may not be so great. It tells us that a series that was supposed to be bold and new resorted to a familiar foe to guide it home. It tells us that a series that was supposed to be bold and new often sustained itself by rehashing stories from earlier series. It tells us that the writers weren’t as willing to take chances and they should have been. Leaving Voyager stranded in the Delta Quadrant would have been an interesting twist. For a minute there I thought it just might happen. But Star Trek loves a happy ending. And Voyager loves a reset button. By now you probably think that I hate Voyager. I don’t. I like all of Star Trek. I even like Star Trek V. But just because you like—or even love—something doesn’t mean the object of your affection isn’t without flaws. My issue with Voyager is the missed creative potential and the unwillingness to dig deep into characters. The series was set up well to deliver something new and unique. The failure to take advantage of this leaves a feeling that something was left behind in the Delta Quadrant, something that could have been extraordinary rather than just good. It’s about the creative whole. If you speak in terms of individual stories, Voyager ranks high on my list. While DS9 is my favorite series, there are probably more Voyager episodes that make my all-time Trek list than there are DS9 ones. Janeway and her crew really had their moments. There are many isolated patches of great writing as they cut their way across the galaxy. But as a series with a vision, a series with direction, a series that develops multifaceted characters whose souls you can peer into, Voyager failed to live up to its promise. In the end, the ship may have found her way home—but the show didn’t.